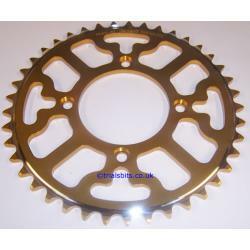 A Talon extra light rear sprocket for the Montesa 4RT 4 stroke models. With groove to assist with mud removal. Available with 41 teeth(standard in 2005), 42 teeth (standard in 2006), 43, 44, 46 and 48 teeth. Please choose your preferred one from the dropdown. Please note, the design may vary slightly.